In the Arctic, many animals live on land, while in Antarctica, life is mainly based in the surrounding waters. Polar bears: are white to help them camouflage (hide) easily in the snow from hungry predators, have large paws to help them grip the ice and have thick fur to help them keep warm. Reindeer (also called caribou) feed on grasses and plants in the tundra in the summer and then travel (migrate) south in winter to warmer places. The underside of each hoof is hollowed out like a big scoop and allows them to dig through snow in search of food. They also use their hooves to paddle through chilly northern rivers and lakes. 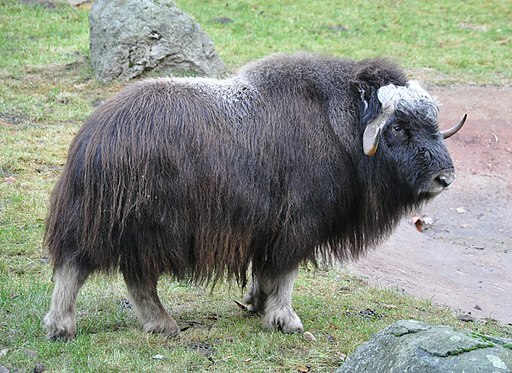 Musk oxen have a fine layer of wool under a thick outer coat. They crowd together so water vapour in their breath forms a cloud to trap heat. Arctic foxes have white fur in the winter to help them blend in with the snow - they then shed this for a brown one as the snow melts in the summer. They have a long, bushy tail which they use to keep their nose and feet warm when asleep too. Walruses have sharp tusks to help protect them from polar bears and use special air sacs in their neck to help them keep their head above water when swimming. Penguins (that only live in Antarctica): have dark feathers on their backs to absorb heat from the sun and have lots of blubber (fat) under their skin to help insulate their bodies. They also huddle together with other penguins to keep warm. Weddell seals live further south than any other mammal. They have grooves in their teeth to help them break holes in the Antarctic ice and can swim underwater for over an hour to look for food.